This post revisits the theme of fullness from Taylor’s introduction that I mentioned briefly in the last post. In the universal quest for the “good life”—the telos that determines what makes life valuable and what is the normative way to live— Taylor distinguishes the believer and the unbeliever by where they locate this fullness (the transcendent or the immanent frame), and what fullness entails (transformation or flourishing). But what does “serving God” mean? Doesn’t the Judeo-Christian God desire our flourishing? (Yes, Taylor affirms). Might not its renunciation simply be instrumental to greater flourishing, some kind of “unnecessary ballast on the journey of life”? Taylor argues this negates the sacrificial power of the “renunciation”; the transformative power stems from this very act of affirming and surrendering the “unsubstitutable good” of our own flourishing. Cynthia Bourgeault, a contemplative writer and priest, puts it even more strongly: “It is easy to fall into the trap of thinking that one dies to the lesser in order to ‘gain’ the greater. But the great spiritual teachers (of which Jesus was clearly among the greatest-of-the great) do not say that. You do not die on a cross in order to ‘set up’ the resurrection; you die on a cross because the willingness to give it all away is itself the original and ultimate creative act from which all being flows…. And so the last attachment must be broken: the attachment to having itself” . Here, the transformative process is clear: the egoic attachment to “having” that rests at the heart of flourishing — having “more” of x human good– must be completely transformed into a different way of being. Here I think Taylor muddies the waters a bit. For example, he uses “flourishing” in two ways: i.e. God’s desiring of “ordinary human flourishing” (such as the physical healings Christ performs in the New Testament) and “fuller flourishing” (what he characterizes later on in the book as agape—universal participation in God’s love). This slippage makes Taylor sound contradictory (we must surrender the goals of our own flourishing to serve a God who desires our flourishing). This is also blurred by his shifts between a “God’s eye view” and the “believer’s view.” From God’s point of view, it is about [“fuller”] flourishing, though on a universal scale; but carrying this out may entail the sacrifice of individual flourishing. He explains, “The fruit of this forgoing is that it becomes on one level the source of flourishing to others, and on another level, a collaboration with the restoration of a fuller flourishing by God. It is a mode of healing wounds and ‘repairing the world’ (18). So while God’s “telos” may entail our flourishing, from the position of our own individual experience (and that perspective is supposed to anchor the book), our telos–devotion to God’s will—may ultimately require its renunciation. This, at least, is Taylor’s (broadly painted) version of the Judeo-Christian believer. Where does Mormonism fit into this? Not comfortably, I think, though we are not the only ones . Mormonism complicates this dichotomy of transcendence/transformation and immanence/flourishing not only through the embrace of innate human goodness and rejection of original sin, but the more radical doctrine that man and God are not ontologically distinct; that as man now is, God once was. If that is the case, how much “transformation” do we believe is really necessary in the path to fullness? Is our “fullness” simply an amplified and immortalized version of human flourishing, rather than radical change or self-transcendence? On the one hand, some passages in LDS scripture do emphasize a kind of fullness continuous with the flourishing of ordinary human desires . Furthermore, Book of Mormon descriptions of dramatic transformations describe the change from sin to righteousness— not a renunciation of actual, legitimate human flourishing . Explanations of the afterlife rest on continuity rather than transformation: we are “restored” to the works and desires of our mortal tabernacle, for good or ill . Or take a much-loved passage by Parley Pratt on the effects of the Holy Ghost: the language bespeaks more of the expansion, perfection, cultivation of human nature than its transformation: “The gift of the Holy Ghost quickens all the intellectual faculties, increases, enlarges, expands, and purifies all the natural passions and affections, and adapts them, by the gift of wisdom, to their lawful use. It inspires, develops, cultivates and matures all the fine-toned sympathies, joys, tastes, kindred feelings, and affections of our nature…” . If I can get away with being really broad , I’d say many pulpit and scriptural discussions of the Atonement depict Christ’s grace as more of a stain-remover than an identity-changer (see Alma 5, for example); the basic “fabric” of our nature doesn’t really seem to change. Perhaps as a consequence, we often treat Christ’s crucifixion less as an example to follow and more as an instrument to our freedom from sin and death—despite Christ’s call (warning?) that “If any man will come after me, let him deny himself, and take up his cross daily, and follow me.” The full-scale transformation and self-denial implied in this scripture doesn’t find much correlation that I can see in the Book of Mormon. So if we look at Mormonism through Taylor’s dichotomy, is Mormonism’s idea of fullness (salvation) more about flourishing than transformation? This could be challenged several ways. One is to point to the overall “prosperity cycle” of the Book of Mormon as a message that man’s tendency towards treating the temporal and spiritual gains of keeping the commandments as “goods” or flourishing shorn of God’s greater “telos” (“fuller [universal] flourishing,” i.e. to love and care for others, alleviate poverty and suffering, etc. ), ends in spiritual and social catastrophe. Or we could look at explicit examples of prophets calling for transformation over flourishing—but this takes us in a tricky direction. The primary example I see of this is the case of polygamy, where Joseph Smith and subsequent leaders ask members to surrender the goals of human flourishing (marital love and intimacy) for a radical “identity [or values] change,” culminating in a heaven populated by dynastic networks and polygamous offspring. Ironically, this is an issue in which the Church has made the most profound reversal, not simply away from polygamy and its radical implications , but towards an enshrinement of the nuclear family (something Taylor associates as a source of “ordinary human flourishing”) as the very essence of salvation and exaltation. In summary, I think Mormonism’s claim that God and man are not ontologically distinct has the potential to reconcile Taylor’s dichotomy—a hugely important feat, in Taylor’s eyes (as we’ll discuss in later posts, though in a nutshell, Taylor asserts it was the tension between the two that fractured Christianity in the first place, and hopes that modern Christianity can ultimately achieve their reconciliation and thus speak to our fundamental human longings and potential). However, before we triumphantly call it a day, I think Mormonism’s position between those two poles can be contradictory and incomplete, and thinking along the lines of flourishing and transformation may allow us to ask fruitful questions. For example, does Mormonism’s ontological collapse diminish the spiritual depth and transformative power that renouncing –or at least questioning—our human “flourishing” could produce? Do we overemphasize the divinity of ordinary human flourishing at the cost of much-needed personal and collective transformation? Is a religion that measures our spiritual worth by our flourishing [i.e. Mosiah 2:41] a bit too egoically satisfying and convenient? Can we find a middle ground in affirming our innate goodness and divine likeness while recognizing the extent of our brokenness, without slipping towards antithetical ideas of total human depravity? What are your thoughts? Centering Prayer and Inner Awakening, 49. There’s also some slippage in speaking about locating our telos (“transcendent transformation” or immanent flourishing) and the sources for achieving that telos (in a force beyond ourselves [grace] or within ourselves [will, reason, etc. ]); the dichotomy breaks down in something like Buddhism, where the transformational resource is “immanent,” or self-contained]). I think that discussions in Mormonism about the emphasis on our own agency and responsibility [immanent resources] at the expense of grace [transcendent resource] speak to that issue. I also find Eugene England’s essay “Joseph Smith and the Tragic Quest” an interesting perspective on the tension produced by individual agency and collective values or needs, and the inevitable tragedy that produces. This seems related to Taylor’s implicit collective vs. individual tension at the heart of God’s desired universal flourishing. Nor is it the only one; in his book on Secular Age, philosopher James Smith takes issue with Taylor’s distinction between transformation and flourishing as a “hangover of… scholastic Thomism,” a discontinuity between grace and nature that Reformed traditions, for example, do not share See How to (Not) be Secular, p 48 FN 1, and pg 32 FN 2. Others have also pointed out that Judaism and Islam do not fit well into these dichotomies for various theological reasons. Mosiah 2:41 seems like a classic example: God’s commandments ensure “blessed and happy state,” both temporally and spiritually. Consider also Mosiah 3:19’s call to become “put off the natural man and become as a child” [an originary, rather than transformative, state]). I know, I know. This whole thing is ridiculously broad. But if you’re talking about Taylor, what else can ya do? Taylor might think so by locating Mormonism in the context of the modern “anthropocentric shift” (17th-19th centuries), where the goals of religion became wedded to the goals of modern civilization, and God’s purposes and mysteries are reduced exclusively to human flourishing. I think there is a lot to say about this, but it will wait for a later post (once we hit chapter 6). I think teachings on polygamy threaten to undo much of the theological radicalness of Mormonism’s claims that we and God are ontologically the same: see Joseph Smith’s letter to Nancy Rigdon [Mormon Enigma 112-113], for example, where the famous “happiness is the object and design of our existence (through keeping all the commandments, etc. )” quote is followed by his explanation that sometimes those commandments might upend our entire moral compass. Instead of ontological similitude, Joseph’s letter emphasizes God’s alterity and unknowability, for “That which is wrong under one circumstance, may be, and often is, right under another”—but “whatever God requires is right, no matter what it is.” This Euthyphroian answer (it is “good” because God commands it) reverses the powerful Mormon teaching that God commands because it is good—i.e., the Good exists independently of God. I think this warrants a separate discussion, perhaps. To my eyes Joseph is fully on board with doing some things on faith. Indeed the typical apologetic (not always borne out by the history) is that Joseph would test people’s faith by offering commands they couldn’t understand. Yet typically there is an assumption that things would be understood and were intrinsically knowable. Clark – Yes, I agree on principle. In that letter, JS does discuss the belief that God only commands things for our happiness, power and glory and basically, if it doesn’t seem that way, it’s because we haven’t understood/seen it all yet. On principle, I think that’s fine. But I also think there’s a difference between unknowability and something that feels/is *wrong* (however we determine that). JS speaks to that also, by saying what may be “wrong” in one context is right in another–which, by itself, isn’t that different from something like Jesuit probabilism or casuistry– but taken as a whole (i.e. the disturbing mechanics of polygamy’s unfolding), I can’t dismiss the possibility of spiritual manipulation or exploitation, either. My main point is really in the last sentence of that footnote, though. I just don’t think Joseph is making the Euthypro move you portray though. It seems his assertions are really pretty conservative. First he’s making the epistemological claim that God is trustworthy when he speaks. So he’s not making an ontological or ethical claim at all. Second he’s making what is a positive ethical claim about context dependence. This might seem a big deal except that I think even a Kantian styled deontologist would accept context matters in some degree. e.g. killing in war being ethically different from killing in peace. Without going to the details it’s hard to make much of it. While I’m sympathetic to the issue of abuse or exploitation you raise, I also think we have to make a distinction between principle and implementation. Often it seems the implementation is taken to determine the aims. From my perspective though the problem of people in the 19th century often doing a poor job of implementation can’t be neglected considering even the unfolding of principles you are probably much more favorable to like communitarian ideals. If we are going to judge I think we need a consistent methodology. The response of “it feels bad” is much stronger I think in that it gets at basic epistemological stances of Joseph although even there it’s complex. Oh, to the main part of your thesis. It seems to me that we’re left with something akin to virtue ethics in Mormonism. However if that is so then we have to deal not just with flourishing from choices but the development as habits of the virtues that enables flourishing. As I said I’ve not gotten far into the book so I have to be careful what I say in my ignorance. But it seems to me from my memory of what I read plus your third paragraph in the above that we are talking about a virtue ethic. The renunciation is very much wrapped up in virtues rather than operational acts such as a more utilitarian analysis of the atonement. Thanks, Rachael–again, your posts are very helpful. I’m inclined to agree with your interpretation of Mormonism as emphasizing more continuity between human flourishing and more transcendent kinds of transformation. I think Alma 41 and the concept of restoration is, as you mentioned, a particularly rich place in scripture to look for continuities. Also, I think a fair bit of recent research in the happiness studies vein on the link between higher purpose and happiness should be of particular interest to Mormons, precisely because of the close link suggested in Alma 41. Clark – I think your interpretation is very plausible, but I think JS’s wording goes too far (in most recorded polygamous situations, generally) in completely upending the involved women and men’s moral compasses to be considered mere “context dependence.” I also don’t think you can easily separate the principle form the implementation– that feels too close to “the ends justify the means,” which I don’t believe is ethically sound. Robert – thanks for your comment. Mind linking a few studies you have in mind, in connection with the Alma 41 concept? And I think Taylor is getting at something slightly different than flourishing with transcendent elements– I think transcendence implies the possibility of flourishing be surrendered, not just brought out of the immanent frame. But he weaves his thoughts on this throughout the rest of the book, so I will try to do a clearer job as I go. There are two issues at play Rachel. The first is the nature of meta-ethics and the second is whether epistemologically we can trust God. As I see it you’re conflating those two issues. The context dependence is about meta-ethics but the focus on faith in God is the separate epistemological issue. When we don’t keep these clear, then I think we end up with the problems you point out. * Here is a study that has a very interesting result and a helpful literature review. The study finds, basically, that focusing on others rather than oneself is a better route to improving happiness. Sonja Lyubomirsky, a psychology prof at UC Riverside, is one of the authors, and her other work is also quite interesting. Katherine Nelson is the lead author of this study and she also has other work that is very interesting (I stumbled across Nelson’s and Lyubormirksy’s work on parenting because they find a clever and more nuanced empirical way to challenge previous findings that have been interpreted as suggesting that parents are less happy, all else equal). For a lit review styled article by these two authors, see here (though it’s narrowly focused on a particular empirical research agenda). * Candace Vogler is a philosopher at the University of Chicago who has recently made headlines for winning a $2 mil. Templeton prize to examine questions of self-transcendence, basically (i.e., meaningfulness in life from a virtue-ethics perspective). See here for the transcript of a recent interview she had with a prominent Utah radio host. Also, regarding transcendence: yes, I was purposely blurring the distinction that Taylor was drawing. That is, contra Taylor, I think the happiness and self-transcendence studies I’ve been referring and linking to suggest a blurrier distinction between immanence and transcendence than I think Taylor is suggesting — and I think this blurrier distinction is something that is strongly consonant with Mormonism, in ways that you’ve suggested in your post, esp. as is suggested by Alma 41. Oh, and I also think it’s interesting that it is in Alma 42 that we get what seems to me like a fairly strong denial of the Euthyphroian answer (in verse 15, that God would cease to be God if He didn’t uphold justice). I haven’t thought too hard about the link between this idea and the ideas in Alma 41, but my first inclination is to think about this roughly in terms of moral realism and some notion of natural law, as I hinted at above. That is, it seems to me that Alma 41 and 42 should be read as suggesting that there is something both divine and deeply rooted in “our” psychology (“our” here referring to both us and to God, and the ontological proximity between us) that makes human happiness deeply consonant with God’s commandments — – but this consonance can be hidden or destroyed if virtue/righteous desires aren’t properly cultivated…. How to take Alma 42 is never completely clear. It can easily be read as a reductio ad absurdum where of course God can’t cease to be God. That said reading it the way you are is pretty common. And of course by Nauvoo the idea that God is radically free and thus could cease to be God appears to be in circulation in the inner circle. I do think it’s true that especially by Nauvoo and at least the idea of a regress of Gods in the King Follet Discourse that there become strong reasons to need notions like justice, goodness and so forth separated from God. But there are plenty of ways one could do that such as a distinction between the ousia and the hypostasis or persons ala the Trinity. (This is the move Orson Pratt makes with his odd materialistic and atomistic take on God) The other is to simply move more towards an ontology more in common with atheists where such notions are still present but are unground from God. Robert – Thanks for the links and the comments. Reading the interview with Candace Vogler, she is articulating precisely what Taylor is after: that exclusive flourishing, in an immanent frame, still leaves us susceptible to “cross-pressures,” or places where the transcendent pushes in on us, so to speak. 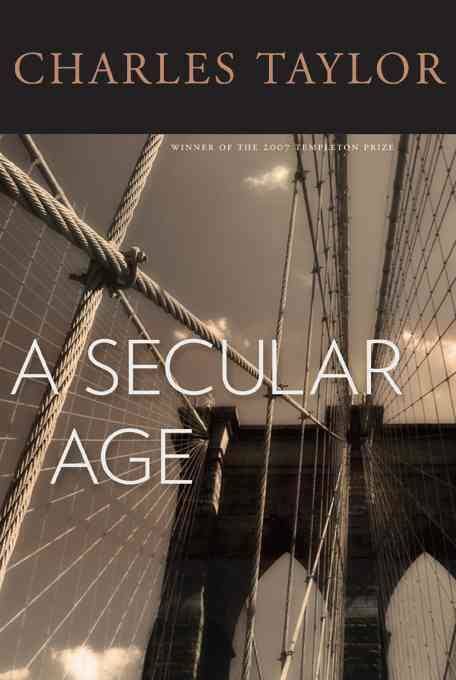 One of his overarching points is that secular humanism fails to respond adequately to our human longings and potential because it excludes the transcendent. So I think trying to nail down his distinctions between flourishing and transcendence actually takes us away from his broader point (especially because I oversimplified it, I think) that they are two broad responses to the quest for meaning, and that one is self-enclosed and one is not, and that the self-enclosed (immanent) option–despite being almost the default option of modern Westerners, leaves us dissatisfied. The second and third parts of his book get at why this is– where secular humanism or exclusive flourishing falls short. So in short, I think any form of flourishing that has an element of transcendence is already moving from the [exclusive, secular, immanence] ‘flourishing’ to the “transcendent” side of the spectrum. I do think Mormonism’s ontological collapse between God and man challenges “two poles” version, but so does Buddhism, in a way– since self-transcendence does not depend on an external, transcendental figure, but rather, a true Self emerging from a false self. This is one of the reasons the Atonement strikes me as having a troubled or perhaps diluted place in Mormonism — because we lack the perceived need for transformation compared to other faith traditions. This is my broad impression, at least. And I wonder at at the costs of that ontological collapse. Also, Robert, thanks for the link between Alma 41 and 42; yes, 42 is another place i find the strongest support for that Euthyphro move, and I hadn’t thought of putting 41 and 42 together that way. That’s very interesting. Clark – The different ways for ungrounding God from those principles is interesting. Do you have a take on which one is more conducive to a Mormon reading? zjg, that’s a good point– our neo-Pelagianism is another important factor, and I think this will come into play more as I get to the 18th and 19th centuries in Taylor’s historical trajectory. I’ll keep that in mind– thanks. Rachel (16) I think we have to be careful with the Pelagian label, even the neo-pelagian one. I understand why some, especially Evangelicals, give us that label. There is a sense in which Mormons see knowledge as the key grace. Certainly we reject the particular type of original sin and grace Augustine presents. However I think we see grace as much more extensive than Pelagius or most Pelagians do. Even acknowledging uncomfort with the term “grace” by Mormons through the 20th century up to probably the 90’s I think our use of the term “spirit” is a type of grace and is very extensive. The spirit (and especially spirit gifts ala D&C 46) are seen as transformative and give us abilities we don’t naturally have in our fallen state. While Mormons will often interpret this in materialistic ways (unlike say Augustine) it is still extensive. Further D&C 46 seems to suggest while we make a free choice to choose God our beliefs and so far are tied to the spirit. We’re much closer to the semi-Pelagians in that we make the first move (in most but not all thinking) and God then increases faith. It’s thus more of a cooperation between man and God. Interestingly protestants typically labeled Orthodox Christians as semi-pelegian for their doctrines which actually seem pretty Mormon. We should, especially with regards to the doctrine of divinization, keep in mind the very different ontology at work though. So I think event the semi-pelegian label is perhaps a tad misleading, although far better than the Pelegian one. zig (15) and Rachel (12) I’m not sure the atonement is treated in a diluted way. I do think we reject the more radical Augustinian and Calvinist takes. But that doesn’t mean it’s diluted. Just that it’s different. I’m not sure I’ll take on the “quest for meaning” since I think that has a bit of an overwrought history within western thought. I do think there’s a certain sense Mormons are led to a more existentialist position whether it be some people’s attraction towards Kierkegaard or other people’s attraction toward Nietzsche. (I tend to have problems with both although I’m more sympathetic to Nietzsche) Nietzsche of course makes a kind of weird move to a virtue ethics. While Mormons with our belief in God can’t be Niezschean, I think we’re often sympathetic to the transformative aspect of his thought for the Superman. I think most Mormons are sympathetic to his attack on the traditional dynamic of Hegel’s master/slave narrative as well. Even if we can’t fully buy into his critiques of charity, I think many do view with a similar skepticism how charity becomes a kind of slavery to those taking it. How much of that is our theology and how much of this is an accident of the rise of conservative thought among western Mormonism I can’t say. Rachel (14) Not quite sure what you mean. Are you referring to my (11)? I think if God is co-equal with existing things (however we take that) then God can’t be the source of the good or ethics in an absolute sense the way it is in Platonism or Augustinian Christianity. This is actually closer to early Hebrew thought where creation isn’t a one time event but an ever repeated creation where God is continually organizing the waters of chaos. A book on this I heartily recommend is Leveson’s Creation and the Persistence of Evil. I think his take on God is very Mormon like (or more accurately Mormon thought ends up being this pre-Hellenistic Jewish approach). In Wrestling the Angel, Terryl Givens provides a really nice account of the tension between Mormonism’s Pelegian thrust in its historical (esp. Calvinist) context in which the early Restoration found itself. The discussion is in the chapter on The Fall – highly recommended for anyone who hasn’t read it (or had repeated dinner-table conversations with Bro. Givens, on this and related topics…). Anyway, I think it’s precisely because of this Pelegian thrust, If I can put it that way, that Jim Faulconer, Adam Miller, and Joe Spencer move in such a definite direction toward specifically immanent grace in their theological work, and why I think they are so drawn to the work of Jean-Luc Marion, Giorgio Agamben, and Alain Badiou on grace (and events, for Badiou) and messianicity (and Buddhist thought, for Adam). Also, my sense is that, except for some notable exceptions – like Jamie Smith – reformed theologians, in particular, have been pretty resistant to these same philosophical/theological trajectories. Rachael, thanks for these engaging and thought provoking posts. This conversation is so fascinating, but I just wanted to comment on your claim about fn 10. I think several strands of thought need to be untangled. (1) The ontology or nature of God. (2) The ontology or nature of morality. (3) The telos of morality. (4) The epistemology of morality. And perhaps even these distinctions are too crude, or pass over a finer grain. (Full disclosure: I am coming at this from an analytic philosophical perspective–and I may have missed some of the points being made from the more continental perspective, since they are less familiar.) I guess I am a bit confused about your claim that Joseph Smith has somehow undone his teachings about God with his teachings about plural marriage. And I don’t feel like this has been cleared up completely in the conversation. Here’s a way of understanding what’s going on without adverting to a denial of the radical anthropomorphism of God. Roughly, I like to think about the Euthyphro problem in terms of grounding (what grounds what). Do God’s commands ground the moral law, or does the moral law ground God’s commands? In these terms, I think that we can say Joseph Smith believed that the moral law grounds God’s commands. When Christ says, “I am the law” in 3 Ne 15:9, I take it that he doesn’t mean that he grounds the law (or that his commands do), but that he knows the law and is obedient to it at such a level that his will will never contradict the law. In other words, whatever God commands will be the law, not because his commands legislate the law, but because they coincide perfectly with the law. Therefore, “whatever God requires is right, no matter what it is.” Therefore, God can remain ontologically similar to humans while being morally other. (1) God is not ontologically other, but morally other (God is a material but morally perfect being). (2) There are universal moral laws that are (a) grounded in the nature of the universe, (b) highly pluralistic (making them highly context dependent), and (c) known completely by God. (3) The telos of morality is for humans to close the “moral gap” between themselves and God, becoming morally perfected, by both (a) learning the moral law, and (b) practicing it (i.e., becoming virtuous). (4) God discloses moral knowledge to humans via revelation through prophets, the light of Christ, poets, philosophers, etc. A brief comment on (3): I think that Mormonism does espouse a kind of virtue ethic, with eternal life being eudaimonia (I am not familiar with Taylor’s work, but I suppose that his ‘flourishing’ is eudamonaic). I think the way I have stated (3) is problematic because it suggests that moral law exists for the benefit of humans, but I don’t think that’s right. Finally, I think you are on to something by suggesting that Mormonism might reconcile the transformative and the flourishing. My thought was that parallels to these concepts might be conversion and eternal life. But, I may not be fully understanding things. All in all, I’m still trying to work all of this stuff out, so please correct me or challenge me. Again, I think we have to be careful with Pelagius. There are elements of his concerns that obviously we share such as a concern with human freedom. Further while we embrace the idea of a fallen nature we all share, clearly the Book of Mormon rejects anything like a shared guilt the way Augustine emphasizes. We end up with a position closer to Calvin with a shared depraved state (albeit often interpreted in the materialist streak Mormons emphasize along with a rejection of total depravity). I reread Givens (whose book really is fantastic for anyone wanting a grounding in Mormon theology) I’m not sure I buy his bit on Pelagianism (I have the iBook version so I can’t get page easily) Admittedly he qualifies it somewhat as “virtual Pelagianism” but the positions he espouses are more complex in that typically they depend already upon the atonement. After all in the Book of Mormon it’s the atonement that already makes us free to choose rather than an initial state ala Pelagius or Caelestius. That’s a pretty huge difference. Givens doesn’t really go into why the atonement as an enabling condition in various ways is very un-Pelagian. Just to add, I think the Book of Mormon on these points should perhaps be read less with the Protestant and Augistinian conception of guilt/sin as a quasi-metaphysical state than the more Jewish notion of ritual uncleanliness versus sin as an immoral act. That then gives both the atonement but also the fall a very different nature than the way the Christians try to simplify it. I’d probably quibble over the meaning of “morally other” as “other” tends to see a big gap whereas it seems the thrust of Joseph, especially in terms of Christ’s perfection, is much more a continuity between us and he morally. That is Christ is literally one of us. While this avoids the types of problems traditional Christology faces with its two natures Mormonism oddly brings them back later. The idea that Christ was special due to physically having God (a perfect being) as father rather than a mortal one undermines the whole idea that there aren’t two natures. This is especially true by the Utah period when this was given various odd materialist thrusts. The whole issue of moral laws is tricky, I think, within Mormonism. I think understanding their makeup is a bit tricky for various reasons. (Not the least the question of whether laws are intending to imperfectly capture justice akin to the duality some read into Paul) Whatever they are, they are at least related (if perhaps not grounded) in the contents of the universe and the relations of the part. Whether they are as absolute as you suggest is much more of an open question. I admit I tend to follow say Blake Ostler here which sees laws as arising out of relations between free beings. However I probably push this more down a pragmatic alley. Clark (17) – Thanks for your clarifications and for the Levenson recommendation– that sounds like a very helpful resource on a reading more conducive to Mormon understandings of God/man. (20) – Do you think that overall, Mormonism does not see our freedom to choose as an initial state? This is the only way that the premortal existence (and Lucifer’s choice) has any coherence, right? (21)- I’m interested in your distinction about the Jewish notion of ritual uncleanliness– that does seem to make more sense of the “cleanliness” discourse around sin/Atonement. Robert C (18)- That’s an interesting connection– I hadn’t seen Miller/Spencer/Faulconer’s work as deriving from that Pelagian thrust. (I’m in the middle of Miller’s “Gospel acc. to David Foster Wallace” by the way- a nice continuation of Miller’s focus on immanent grace). Where does Miller explicitly discuss Mormon/Buddhist connections? I think they have a surprising amount of overlap in many ways. Derek (19) – Thanks for those helpful classifications– that untangles some of what I’m trying to suggest. I agree with your reading on Christ perfectly embodying/adhering to the law, thus enabling him to say that he “is” the law– and I agree with what JS, at some points, seems to be saying about that. But the case of polygamy is very problematic, to me, because JS knows he is asking practitioners to do something they find morally repugnant– in my research on polygamous autobiographies, it comes across initially as an Abrahamic sacrifice (implying a suspension of moral laws and their flourishing for a temporary test) and then warps into a “new law,” which is radically different step. Because JS still wants to justify God (and his commandments) as good, it requires some theological gymnastics that were and are heartbreaking and repugnant in their devaluation and instrumentalization of women and children. This, to me, is calling evil good. I don’t think the damaging implications of polygamy have been fully recognized. Just to note, Levenson is a jewish scholar who buys into the main tenants of Biblical scholarship such as multiple contradictory authorship of most texts but especially Genesis. Indeed his analysis depends upon this. So while it has interesting views for a Mormon it doesn’t mention Mormonism at all. Regarding freedom, that ends up being much more complicated than it appears at first glance. What exactly freedom even means is something philosophers continue to debate. Historically the two main thrusts in Mormon thought are the Pratt view that see things ontologically as free material atoms that choose and then develop a kind of unity. There’s lots of problems with his view but it’s been influential even among those who reject his atomism. Then there’s Brigham Young who tends to dismiss most metaphysical thinking and thinks theology should be what we might call an anthropology. So he only talks about us as humans although he thinks there’s pre-spirit birth ‘stuff’ but it’s not really us in any normal fashion. (In modern terms he’s adopting a very materialistic conception of mind as opposed to Pratt’s property dualism) There’s more views than just those two, for instance, but even there you can hopefully see that what we mean by freedom and what we mean by “initial state” vary quite a bit. Regarding premortal existence things are complex too. For instance Mormon thought often puts forward a theory of theodicity where we need mortality and a separation from God to be free and make choices. This ends up being in big tension with the theology of the war in heaven where presumably 1/3 of the angels were free enough to be in rebellion against God. There are other elements of Mormon thought in tension here as well. My sense is that broadly speaking Mormons adopt Arminianism and are aghast at Calvinism. However that doesn’t explain as much in Mormon theology as some suggest. Regarding uncleanliness all I mean is that in Judaism we could be unclean in a way completely unrelated to sin. For instance no one would see menstruation as sin but that had various proscriptions associated with it in Jewish thought. (I don’t think anyone knows when these developed though) All I’m saying is that there’s already precedence for being in a physical state that is innocent of guilt but that would cut one off from God. That’s all Mormon thought requires for the fall. This is at odds with Augustine where the fall imputes moral guilt of some sort. Add in the Mormon conception of sin as requiring the ability to deliberate in some sense and I think we just reject Augustine entirely. There is a bit of wiggle room since the Book of Mormon tends to see say the sins of children as taken care of Christ automatically. While this seems even more anti-Augustine it does suggest that perhaps there really are sins we might not be accountable for. The fact the atonement covers them is God solving the problem but presupposes guilt in a fashion closer to Augustine even if not exactly the same. So far as I know this is an element of Mormon thought that hasn’t really been analyzed much though. Rachel (23) Adam’s book Speculative Grace is written for a secular audience. To my reading it’s clearly very Mormon but doesn’t (as I can recall without checking) mention Mormon thought. It’s worth reading though. Most of the places I’ve encountered him being more explicit on the Mormon connections came in discussions of LDS-Herm. If you join LDS-Herm you can then search the archives. He and I had a fairly long discussion on the topic. There was also a thread that lasted a while regarding Mormon/Buddhist overlap. Whoops. I should have mentioned Immanent Grace too which I think gets at those issues more. Alas no Kindle version. Side question: I have often lately seen phrases like “the main tenants of Biblical scholarship”. Are we dealing with a language change and a new meaning of “tenant” as a replacement for “tenet”? Or are we dealing with an auto-correct/spellcheck or proof-reading problem of the kind I often have? Yeah, I’m not sure Adam ever explicitly discusses Mormon/Buddhist connections. I thought his “Take No Thought” article was esp. Buddhist, but I couldn’t find an explicit reference (even in the Perspectives on Mormon Theology version, but after a quick peek I didn’t see any). I’ll paste a list of Adam’s blog posts (in a separate comment, since they’ll probably get filtered) that are more explicit about his Buddhist interest – but they (typically) don’t explicitly link up with his Mormonism…. Promised blog links – first from various blogs, then a selection from a series of posts at the church & pomo blog. I’m new to participating in blogs at all, so is a long response like this discouraged? Should I have just made several responses? Can you offer some practical blog conversation advice to me? I think you are right that there is something misleading about saying that Christ is other. I’ve wondered if Christ is far more human (morally speaking) than we sometimes believe. A worry I’ve had is that the way we sometimes talk about Christ puts him so far above the rest of humanity that it makes Alma 7:11 seem untrue or inaccurate. Moral facts obtain in virtue of relations obtaining between agents. So that the grounds for moral facts are the relationships that hold between individuals. This allows for context sensitivity, since relations are constantly changing and a particular to individuals. This also allows for mind-independence (in some sense) (i.e., objectivity, or in some weak sense universality) because whether I think a relation holds or not does not determine whether it does (although there might be some cases that don’t fit this quite right). This makes sense out of Christ’s statement that the first two commandments are about relationships between agents. I am worried about natural law theories, in part because I think they have a problematic metaphysics. So, I don’t conceive of moral laws in that way. On my view, moral laws might be moral like descriptions of certain properties that obtain when agents arrange themselves in relation to other agents intentionally, dispositionally, or in some other ways. Of course, I can’t say any of that without recognizing there are problems and gaps. But, I think something like that might be correct. Step 1: Polygamy is a refiner’s fire/Abrahamic sacrifice. Step 2: Polygamy is a new spiritual/moral law. I think I can see this from the historical stuff that I have read. So, I won’t dispute that. It’s at Step 2 that you think the really damaging stuff happens (the “devaluation and instrumentalization of women and children”). So your argument is that, supposing Step 2 is the will of God, then it challenges the view that God is, himself, subject to moral laws. In fact, it is evidence that God legislates the moral law. Is this right? First off, I don’t know what to think about the polygamy stuff. That’s an area I don’t feel I have formed concrete views about. I am sort of hoping someone will say something really clear and helpful about it that I can just endorse. But second, I don’t think that committing to Step 2 being God’s will entails that God legislates THE Moral Law. Perhaps God does legislate (lower-case m) moral laws, while still being subject to The Moral Law, or something like this. In which case, God can as the mediator of Moral Law legislate moral laws that will facilitate our learning The Moral Law, but which are somehow preparatory or some such. I suggest this as a possible alternative, not as a view I am endorsing. In any case, I think you are providing an interesting challenge I haven’t thought about much before. Am I getting your argument correct? First, could you say some more about what you think the claim that God and humans not being ontologically distinct can do for reconciling Taylor’s dichotomy? Second, my own thought on this is that part of what it means to flourish (in Mormon thought) is to be transforming. But transformation is not a sufficient condition for flourishing (let’s concede that we can transform in regressive ways). The plan (as I understand it) was for God’s children to grow and progress (i.e., transform) towards becoming more like God—a normative ideal with a moving horizon. In this way, the concepts of progressive transformation and flourishing can’t be entirely pulled apart. I agree that the war in heaven is a decisive objection to the view that mortality and(/or) separation from God are needed for free agency. I think part of the problem in developing an account of agency, is that the questions we are trying to find answers for are not entirely clear. What’s the shape of the problem? (1)	Human beings have moral agency (in some non-compatibilist sense). (2)	God has perfect foreknowledge. (3)	We live in an apparently deterministic universe. (4)	Humans are morally responsible for their moral actions. The problem is that (1) and (4) are in tension with (2) and (3). A first pass of making these sorts of things jive better: (2) God has perfect foreknowledge, but not absolute foreknowledge. This is a weakening of (3) to make it compatible with (1) and (4). And second, deny (3). The evidence for this relies on either a strong version of (2) or Newtonian physics. We’ve done away with the strong version of (2), and we think Newtonian physics is wrong—although, it’s not clear that an indeterministic universe is better—and it’s also not clear what sort of universe we do live in. I think it is probably neither indeterministic nor deterministic (maybe I sound crazy now—and I probably am). Could you point me to some articles or papers on the distinction between sin and uncleanness? Also, what are your thoughts on the transgression/sin distinction? Love the new blog look but alas no comment numbers which makes it harder to be clear about what comment you’re referring to. I also somehow missed the comments on this post. So sorry for the delay responding. Robert, so far as I know only LDS-Herm has Adam making an explicit Mormon/Buddhist engagement. I largely agree with him although I really don’t like using the term grace to refer to all that. The problem is that this immanent secular grace which is basically the happening of the universe seems to be different from grace as Mormons understand it which is gifts from God. The reason is due to the ontology Mormons have rejecting both creation ex nihilo as well as rejecting more Platonic conceptions of God as the One with all emanating from him. That is God is an actor within the universe. The whole hellenistic absolutism, while not fully rejected, is fully rejected as a discourse about God. This has lots of implications I think but it also undermines a lot of aspects of the Buddhist/Mormon connection. With regards to freedom whether or not the universe is deterministic doesn’t solve things as well as one assumes. An universe that ontologically involves chance (as most physicists assume) still has the same implications. Alfred Mele has written on this. His Free Will and Luck is a good primer. The type of moral agency the the scriptures talk about just isn’t the type of free will that contemporary philosophers talk about in my view. That’s not to say one has to embrace compatibilism. I’m frankly agnostic on that question. Just that I don’t think our theological commitments require us to embrace the kind of libertarian agent free will that Blake does. With regards to knowledge, I’d note that I don’t think we’re necessarily committed to position of greek absolutism. That is we just require God have some foreknowledge not total foreknowledge. Because of Blake’s commitment to libertarian agent free will he rejects all foreknowledge except God knowing he can bring something about because of his power versus the power to could potentially oppose him. I think Blake’s wrong in this for a variety of reasons. BTW – as a quick addition, an interesting implication of our rejection of creation ex nihilo is that it seems God knows via mediated knowledge just like all beings do. An implication of that is that God logically can’t distinguish between chance and free will even if there is ontological free will in the universe. I can sketch out the argument for this if you need. Clark, I fiddled with it a bit but I don’t know the php call to grab the current comment number, nor am I inclined to figure it out. Until we do, I suppose you could go off the time stamp to reference prior posts. Sorry. I can do the time stamp. That’s what I do at BCC. There’s a plugin for numbering but I don’t know if the php works with all plugins or themes. Love your comments and analysis Rachael. And Clark. Keep them coming! BTW Frank, not really a big deal but the plugin I use for comment numbering is Greg’s Threaded Comment Numbering. It’s fairly easy to customize the appearance in the php for your site. I’ll take a look. Thanks! Meanwhile, I am experimenting with nested comments. Because after the first decade I guess we can give it a try.